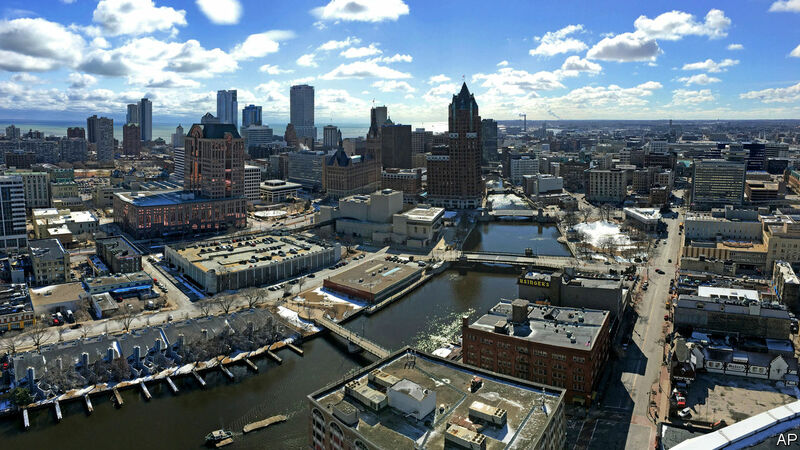 MILWAUKEE HAS fine breweries, a Harley Davidson museum and a history of attracting lively socialist settlers from Europe. It offers views over Lake Michigan. And it is just big enough, with 17,000 hotel rooms, to host hefty conferences. But none of that explains why the city beat Miami and Houston, bigger rivals, to host the Democratic convention in July 2020. When party delegates gather to pick a candidate to run against Donald Trump for the presidency in Milwaukee they will be signalling a renewed focus on the Midwest. Milwaukee will be the first Midwestern city to host a Democratic convention since Chicago in 1996. After Hillary Clinton’s neglect of the region in 2016, the party wants to make amends. “We are ready to set an example, proving Democrats can be strong where many counted us out” says Mandela Barnes, a Milwaukee native and the lieutenant-governor in Wisconsin. Had Miami or Houston been picked that might have suggested a Democratic plan to win over new voters in the South in 2020. But Mr Trump won because he scooped the electoral-college votes of Wisconsin, Michigan and Pennsylvania, states where Mrs Clinton considered her support rock-solid and barely bothered to campaign. Mr Trump won by a whisker—23,000 votes—in Wisconsin, the first Republican to take the state since Reagan in 1984. He wasn’t popular—Mitt Romney got more votes than he did there four years earlier—but he was more popular than Mrs Clinton. She did poorly in Milwaukee, a Democratic stronghold with a large African-American population. Blue-collar workers, including many blacks, who lost factory jobs over the years, saw Mrs Clinton not as their champion but as a supporter of the free trade they believed had weakened American manufacturing. Their low turnout was a reminder to Democrats not to assume African-Americans will automatically show up for the party. Mrs Clinton and her team were also neglectful. She was thrashed in Wisconsin in the Democratic primary by Bernie Sanders, who won 71 out of 72 counties there. Perhaps bruised, she then left much of the on-the-ground campaigning in the general election to him. Dan Kaufman, author of “The Fall of Wisconsin”, which traces the decline of Democratic clout in the state, notes that Mrs Clinton became the first presidential candidate of either party since 1972 to fail to visit Wisconsin in the general election. Compounding that mistake, she did not buy many TV ads in Wisconsin or Michigan, despite Mr Trump’s furious campaigning in the region. In the final weeks of the campaign, Mrs Clinton’s ad-buyers spent more in Omaha (with a single electoral college vote at stake) than in Wisconsin and Michigan combined (worth 26 votes together). Democratic bosses want to show that the Midwest—and especially Wisconsin—won’t be forgotten in that way again. Philip Rocco, a political scientist at Marquette University, in Milwaukee, talks of the “acrid tang of 2016” as Democrats try “to counteract their failure to truly campaign” there. He expects the party will emphasise “how the state’s working class has failed to flourish under Republican leadership”, after eight years of Scott Walker as governor (he was thrown out by voters in November) and four years of Mr Trump. He also expects much attention on Mr Trump’s promises to the Midwest on trade and the revitalisation of manufacturing. A prime example of the difficulty of getting big new investments lies just a few miles south from the convention hall. Foxconn is supposed to be building an enormous assembly plant, much boasted about by Mr Trump, near Racine. The Taiwanese firm was promised enormous state subsidies if it creates 13,000 jobs in the coming years. But the project is at risk of going off the rails, as Foxconn backs off from manufacturing activities and tries instead to create a campus for high-skilled engineers, designers and IT folk. Few jobs for the local and low-skilled have been created at all. Can Democrats expect to do better in Wisconsin in 2020, assuming they pay greater attention? There are some positive signs. In November, Tony Evers, a Democrat, managed to turf out Mr Walker from the governor’s mansion. A Democratic senator, Tammy Baldwin, held her seat, and 53% of the votes cast for the state assembly went to Democrats (though gerrymandering meant Republicans won more seats). Much depended on urban votes. “Democrats can win with a high turnout in the urban areas, but they need the young and African-Americans to turn out in high numbers”, says Barry Burden, of the University of Wisconsin, in Madison. That requires lots of enthusiasm and “it just – only just – worked in 2018, it’s a risky strategy” he says. An alternative and perhaps preferable approach is to return to ways of old, picking up some votes from rural areas and small towns, appealing to progressive farmers, he says. The dilemma between appealing to urban voters alone, or trying to bring in some rural votes, is a common one across the Midwest. The Democratic governor of Kansas, Laura Kelly, has a long record of appealing both to rural and urban voters, but more often Democrats rely heavily on city-dwellers’ support. In Illinois, Democrats have broadened their appeal from cities alone to capture more suburban districts, but most rural areas are solidly Republican. In Minnesota, a once-safe Democrat state, rural and small-town voters are fervently Republican. The strategy Democrats adopt in the Midwest will largely depend on which candidate dominates at the convention in Milwaukee. Mr Sanders is considered to have a big advantage in Wisconsin. He can also draw on well-established local activist groups to serve as his campaign infrastructure. Joe Biden, who has not yet announced, could also do well among traditional Democratic supporters, notably in places, like southern Wisconsin, long dominated by manufacturing. Only two true Midwesterners are in the running so far and could plausibly talk of Milwaukee as being near to home. Amy Klobuchar, a senator from Minnesota, has shown she can pick up votes from rural areas. She has already been campaigning in Wisconsin. But as a centrist, with no obvious appeal yet to African-Americans or blue-collar voters, she might struggle. Pete Buttigieg, the mayor of South Bend, in Indiana, is young and articulate. But he remains the longest of long shots for now. If others such as Cory Booker, Kamala Harris or (assuming he will run) Beto O’Rourke do better in the primary race, then a Democratic focus on the Midwest might prove less appealing. Mr Rocco, of Marquette, notes that Democrats could risk “fighting the last fire” if they bet all on winning back blue-collar workers and the Midwest from Mr Trump. The alternative is to excite new voters—in the ever-more populous southern states of Florida and Texas, or heading west to Arizona, for example—by wooing Latinos, African-Americans, women and the young. The choice of Milwaukee this week suggests the Midwestern route is currently favoured. By July 2020, much could change.